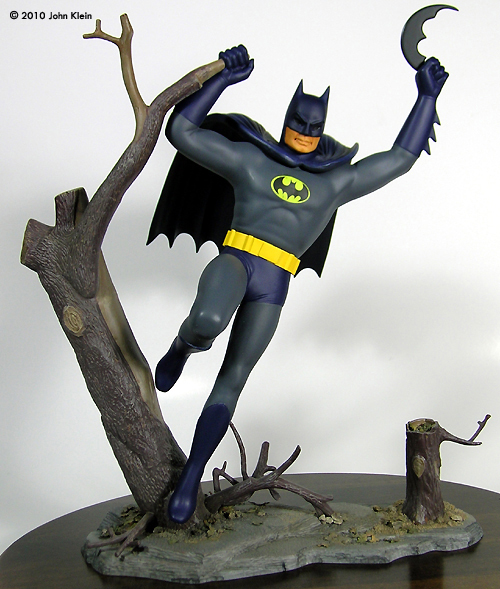 I recently refurbished this Aurora 1/8 scale classic issue Batman for a friend. He had it in his collection for quite some time and it was in serious need of a makeover - figures aren't really my thing but I thought I'd give it a shot. The figure as I received it was in pretty rough shape; it seemed to have initially been assembled with good old fashioned Testors tube glue and lots of it; there was also evidence of repairs over the years which were executed with liberal amounts of Crazy Glue. The painting of the figure was actually not that badly executed but my friend wanted it painted in different shades of grey and blue than the original paint job. I had a great deal of glue and seam cleanup to deal with so I decided to strip the whole thing and disassemble all the pieces… this is where I first ran into problems. The painting seemed to have been done with a selection of automotive spray lacquers. My standard arsenal of paint-stripping techniques proved useless. Oven cleaner wouldn't scratch it, heat wouldn't soften it - I even tried mild paint thinner to no avail. I was worried that lacquer thinner would attack the plastic so I tried one last thing before resorting to that. I tried using a citrus-based cleaning solvent called Citra-Solve; that was a big mistake. Pleasant orangey aroma aside, this stuff is an extremely aggressive solvent which not only did a number on the old glue and paint but also on the underlying plastic. The solvent caused the surface of the plastic to soften and wrinkle and then harden into something more closely resembling the Elephant Man than Batman. Fortunately, I was able to putty and sand away most of this rough texture but the facial features were damaged beyond repair. A buddy came to the rescue and provided me with a spare Bat Noggin he had left over from a conversion. He also provided me with a spare Bat Emblem decal and a full size scan of the Batarang which I used as a template to fashion a replacement for this missing accessory. The assembly of the figure was pretty straight-forward; after cleaning off the old paint and glue and sanding everything smooth I assembled the head, limbs and torso as separate sub-assemblies. I also sanded off the moulded-in utility belt as I felt the detail in this area was too soft and indistinct and I planned to replace the belt with a new scratch-built item. With the torso and limbs assembled separately, I drilled a pair of holes in each limb at the point where they attach to the torso. These holes allowed me to flow in a splash coat of epoxy resin after the limbs were attached. I always use a splash coat inside any hollow construction, particularly one with fragile joints or one that needs to withstand any sort of rough handling during construction - for me, rough handling is standard. I feel this splash coat re-enforces all the glued seams and in this case, provides a more solid join between the limbs and the torso. After attaching the limbs to the torso with solvent cement, I poured an ounce or two of two-part epoxy into the body cavity and sloshed it around until it had flowed into all the limbs and evenly coated the inside surface of the model. After all this had hardened, I puttied and sanded all the seams and then coated the puttied areas with Mr. Surfacer prior to a final finish sanding. I then primed the figure with Rustolium Painter's Touch Grey Primer and touched up any flaws. As stated earlier, I had a full-size scan of the original Batarang to use as a template so I simply traced the shape onto 1/8” thick styrene sheet and cut, filed and sanded it into shape. For the Bat Utility Belt, I cut a ¼” wide strip of thin styrene and trimmed it to length after test fitting it around the figure's waist. I detailed the belt with a buckle made of two layered styrene rectangles, six half-round styrene rods and a couple of bits from the spares box. I then repeated this process after the yellow spray lacquer I used to paint the belt dissolved the thin styrene - that was my reward for trying to cut corners. I then primed the accessories and set them aside. I undercoated the figure's head with Tamiya Gloss Orange and then airbrushed the exposed parts of the face with layers of Tamiya Flat Flesh. After this had dried, I masked off the flesh areas and airbrushed the cowl with Tamiya X-3 Royal Blue. I added a few drops of Flat Black to this mix and sprayed this onto a masked off area of the cowl directly above the face as my references all indicated that this area is darker than the rest of the cowl. I then dry-brushed the raised areas of the face and washed the figures eyes with layers of brown and black ink over a white base-coat. The figure was given an overall coat of Tamiya XF-24 Dark Grey. This was masked off and the boots, gloves and shorts were sprayed with Tamiya X-3 Royal Blue. The cape was also painted with Tamiya Royal Blue, the inside surface of the cape being given a coat of the same colour darkened with flat black. 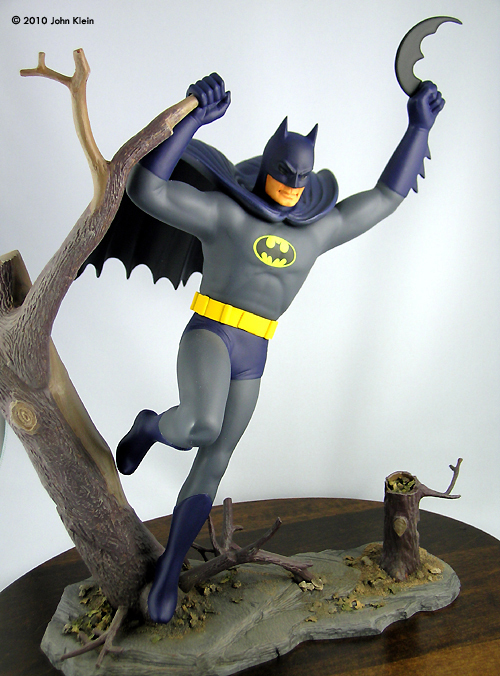 I airbrushed a coat of Future Floor Wax over the entire figure and applied the Bat Emblem decal. I sealed the decal in with another coat of Future. The Batarang was painted flat black and the utility belt Tamiya XF-3 Flat Yellow. To attach the utility belt, I applied a coat of super glue to the inside of the belt and wrapped it around the figure's waist, closing the buckle with solvent cement. I was concerned with the tenuous attachment of the cape; it only attaches at two tiny glue points on the figure's shoulders. I didn't think this was strong enough to support the heavy cape so I drilled and countersunk two small pilot holes through the cape and into the shoulders and drove a pair of coarse-threaded screws through the cape to secure it. I then filled the counter-sunk holes and screw heads with Milliput and tooled the filler to restore the folds of the cape which were damaged. I coated the filler with Mr. Surfacer, sanded it smooth and painted the area with Tamiya Royal Blue to blend it in to the surrounding area. After airbushing a few layers of Testors Model Master Flat Clear, I put the figure aside. As the base came to me unpainted, I didn't have much prep work to do except to separate the trees from the “rock” slab and clean up the seams a bit. Before I re-attached the trees to the base, I drilled two holes through the base to accept a pair of short bolts which I would later use to attach the model to a larger wooden base (these bolts also came in handy for handling the base during construction); the bolt heads would be hidden underneath the hollow tree trunks. I also filled the hollow underside of the base with epoxy resin to give it some added rigidity. The trees were originally attached to the base with a very liberal amount of glue and some damage occurred when separating them; there was also some glue residue lining holes in which the trees locate. These two factors prevented the trees from seating properly in the base so I camouflaged the resulting gaps with some fine sand, small rocks and scale leaves, all of which were attached with diluted white glue. I painted the trees in various shades of brown and after priming the rock slab, decided to leave it primer gray - it looked right. I gave the whole works a series of brown and black washes, some light drybrushing and a light overspray of heavily thinned Tamiya Flat Earth paint to blend it all together. I attached the figure to the base with epoxy and placed the Batarang in the figure's left hand. I then airbrushed everything with a couple of coats of Testors Flat Clear and set it aside for a couple of days to dry thoroughly. I drilled a pair of holes through a stained basswood plaque to accept the bolts protruding from the figure's base and counterbored the bottom of the plaque to recess the nuts. This page copyright © 2010 Starship Modeler. First posted on 8 April 2010.